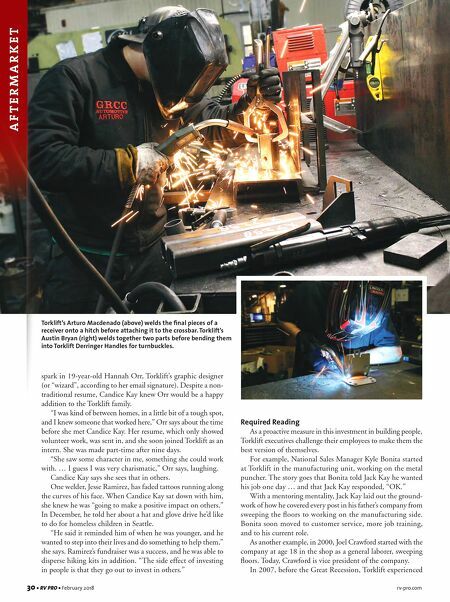 28 • RV PRO • February 2018 rv-pro.com A F T E R M A R K E T SUMNER, Wash. – On a recent winter day, worker stations at Torklift's 52,000-square-foot facility buzzed with activity, a cacophonous symphony of laser-cut metal, metal, and the abrasive sanding of vehicle parts to ensure a final polish. It was the sweet sound of success for Torklift, a manufac- turer of tie-downs, turnbuckles, towing products and sus- pension products for the RV industry, which has experienced significant growth in recent years, including a 25 percent increase in year-over-year growth last year. Still, it's not the equipment itself that accounts for the company's success – it's the employees operating that machinery, according to Candice Kay, senior vice president of sales and marketing for the company. Torklift, based in Sumner, Wash., a city of about 10,000 people located about 45 minutes south of Seattle, has managed to attract a diverse workforce and to invest in those employees, cultivating its next generation of company leadership in-house, she adds. For years, the Washington- based RV supplier has prioritized investing in its employees, which has paid off with record company growth in 2017. By David MacNeal Torklift 'Builds People' PHOTOS COURTESY OF TORKLIFT Torklift President Jack Kay (left) and Vice President Joel Crawford are pictured in front of Torklift's original location in Kent, Wash. Crawford started at Torklift at the age of 18 as a general laborer and worked his way through the ranks to rise to an executive position. 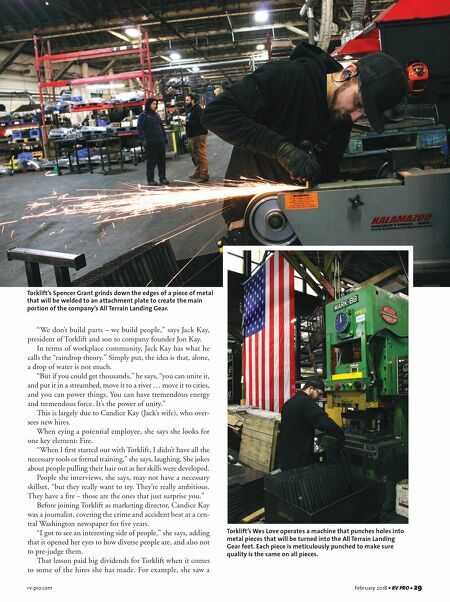 Torklift is a big believer in giving employees opportunities to grow with the business.